"Nature for us is made, as both fiction and fact. in particular times and places." Can biotechnology be used to create work as moving as music? Where are the thresholds between science and its ability to change our emotional landscape? The current research of this project involves a set of plants, which bud, bloom, and smell in specifically designed and emotionally charged ways. In exploring potentials of biotechnology as a design space within olfaction and emotional memory, this set of projects explores evolving relationships between humans, nature, and new sensorial modalities to re-live transient experiences. How do we define “nature”? What possibilities exist in redesigning nature and its sensory interfaces? How much of my own anthropocentric view do I apply on the rest of the world, and can I really escape this framework as a human? What are the limits to human-plant communication, or interspecies empathy in general? How do these works raise existential questions on our own human relationship to nature itself, or each other? How do these designs critique a neoliberal capitalist relationship to nature as an expendable resource? If you could speak to plants on their own chemical signatures, what would you want to confess? 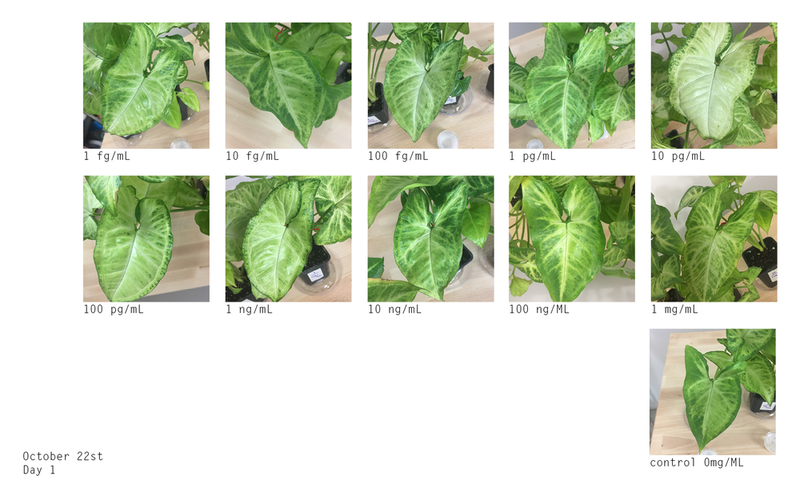 In this project, I am exploring loneliness while designing a novel human plant interaction that allows a kiss to effect plant growth, blooming, and various morphological changes and behaviors. One of the active compounds n the lipstick is ACC (1-Aminocyclopropane-1-carboxylic acid) which is a disubstituted cyclic α-amino acid in which a three-membered cyclopropane ring is fused to the Cα atom of the amino acid. Ethylene is the plant hormone that stimulates and regulates the ripening of fruits and the opening of flowers. Because ethylene is a gas, we used its precursor, ACC in the lipstick instead- ACC plays an important role in the biosynthesis of the plant hormone ethylene. The speculative biological components of this project were inspired by and done in collaboration with scientist Noam Prywes. Structural scheme of ethylene biosynthesis and 1-aminocyclopropane-1-carboxylic acid (ACC) conjugation/metabolism. Image reference: 2014 Van de Poel and Van Der Straeten.